When? 2004 | Where? DVD, Netflix. With so many Americans feeling disheartened about the current election, now seemed like a good time to look back on an era where we all had a candidate we could believe in—one who would make our wildest dreams come true. Or maybe I just got nostalgic because I saw a guy in the 99 Cents Store sporting a “Vote for Pedro” shirt the other day. Either way, Napoleon Dynamite is definitely a movie worth revisiting. 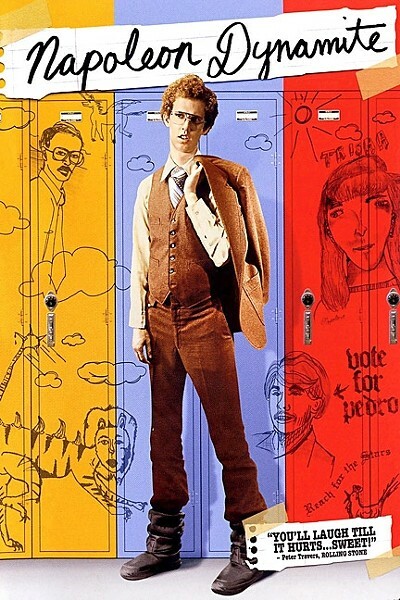 The plot follows the title character (Jon Heder) trying to navigate the nuances of high school life, particularly bullies, all while dealing with his absurdly dysfunctional family and his status as a quirky outcast. He eventually befriends Pedro Sanchez (Efren Ramirez), who decides to run for class president against the most popular girl in school, Summer Wheatley (Haylie Duff). While this may sound like the synopsis of dozens of other teen movies you’ve seen, Napoleon Dynamite’s execution makes it anything but. QUOTEABLE: Remember that time when all people did was repeat quotes from 'Napoleon Dynamite?' Let's do it again. My main criticism of this movie is how ambiguous the timeline appears to be. According to the opening credits, which feature Napoleon’s student ID, it supposedly takes place during the 2004-2005 school year. However, the fashion choices and technology shown throughout imply anywhere between the 1970s and 1990s, and the soundtrack feels similarly dated. It’s difficult to believe that the story takes place in the mid 2000s when the characters are surrounded by VHS tapes and side ponytails, with not a single flip phone in sight. Although, now that the movie is more than a decade old, this ambiguity also comes off as a strength, giving it a timeless, ever-relatable feel. Some criticize Napoleon Dynamite’s abrupt, montage-style, happily-ever-after-for-all ending, saying that it comes too easily. I disagree; the strange but well-intentioned characters have endured enough torment, and no matter how many times you watch it, there is always something heartwarming, inspiring, and immensely satisfying about seeing them all overcome their hurdles one by one. And of course, President Pedro has to keep his campaign promise to make everyone’s wildest dreams come true.